Thanks everyone for all the great comments on cribs. I really enjoy reading everyone’s thoughts. One of the fun parts of blogging is the comments and interacting with people. Movie Mom told me yesterday that I needed to post a new pregnancy picture so here I am at 28 weeks. Only 12 weeks to go – eeeeeep! Please excuse the weird look on my face. It was early this morning. And I always seem to have a double chin in pictures so I was trying to stick my head out a bit to avoid the double chin. It just ended up looking weird! 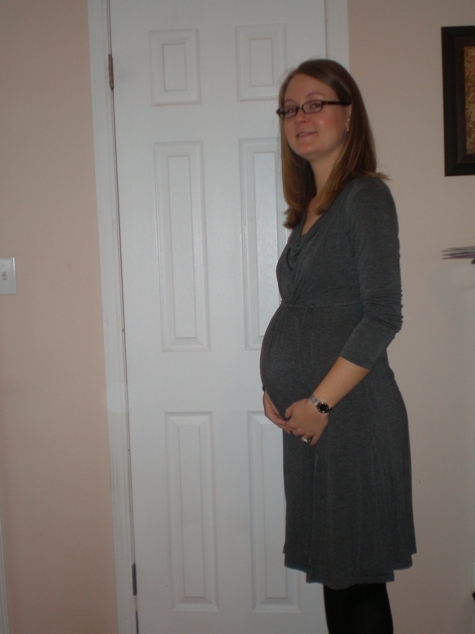 I’m wearing one of my favorite maternity dresses that I got on the Target clearance rack for only $7! It’s so soft and comfortable. Actually all maternity dresses are it seems. I have several. I would wear them everyday if it was warmer. Once spring hits I’ll be rockin’ the dresses more often. Sometimes I have trouble getting deep breaths, which I think is just a side effect of the baby getting bigger and pushing all my organs up. My feet and ankles have started swelling a little bit at the end of the day. It goes away by morning but then gradually increases throughout the day. It’s worse when I wear heels so I think I’m done wearing heels for awhile. My black flats and I are new BFFs. I have officially gained 16 pounds as of today, which is right on track. I think I’ll end up gaining 25-30 overall. I’m still working out 1-3 times per week when I can. I am just doing 25-30 minutes on the elliptical and then a few weight lifting exercises. I just do light weights and lots of repetitions. One day a couple weeks ago it was really warm outside so I walked 2 miles on my lunch hour. It felt great to be out in the sunshine. I’m hoping to do some more walking as the weather gets warmer. One other strange symptom I’ve been having is very dry skin. I’m not sure if it’s pregnancy-related or just because it’s winter. But I’ve never had such bad dry skin in past winters. Any other moms have this problem? This week we have our special 3D ultrasound scheduled. I’m very excited. Both Movie Mom and MIL are coming too. I’ve been lucky to have three ultrasounds so far and this will be the fourth (although not covered by insurance). It will also probably be the last time we see Baby Boy until he’s born. I can wait to see how much he’s grown. I really hope he cooperates and lets us get a good picture of his baby face! YOU look great & I just found your site & love it!